Down in the lightless depths of Ur-Menig, beyond where surface dwellers can breathe, is Sifoon, the City of the Carreg. 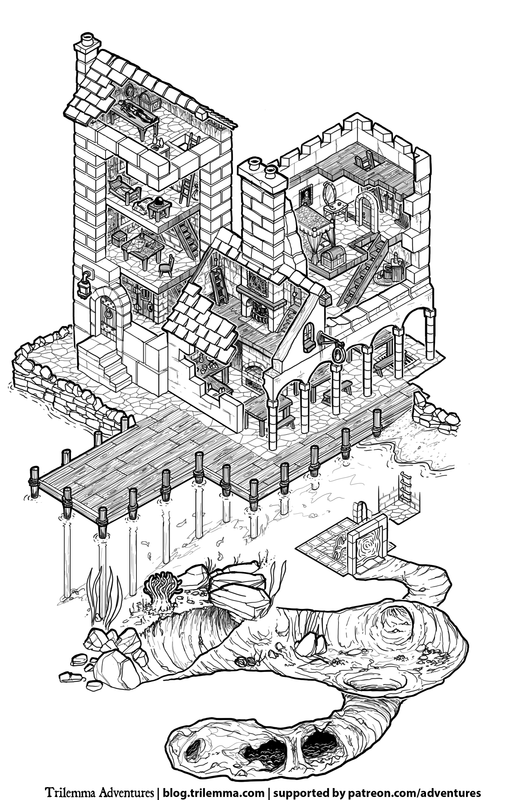 Once a jewel of the underworld, the laconic clay-people have seen their hold over the city dwindle to barely three districts. 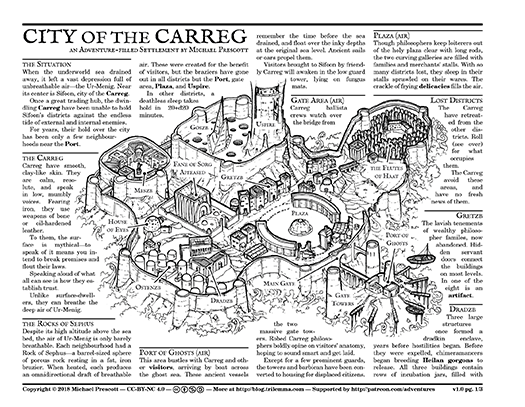 Ever since the Carreg first made an appearance in the Steeps of Ur-Menig, I've been wanting to write more about this place. 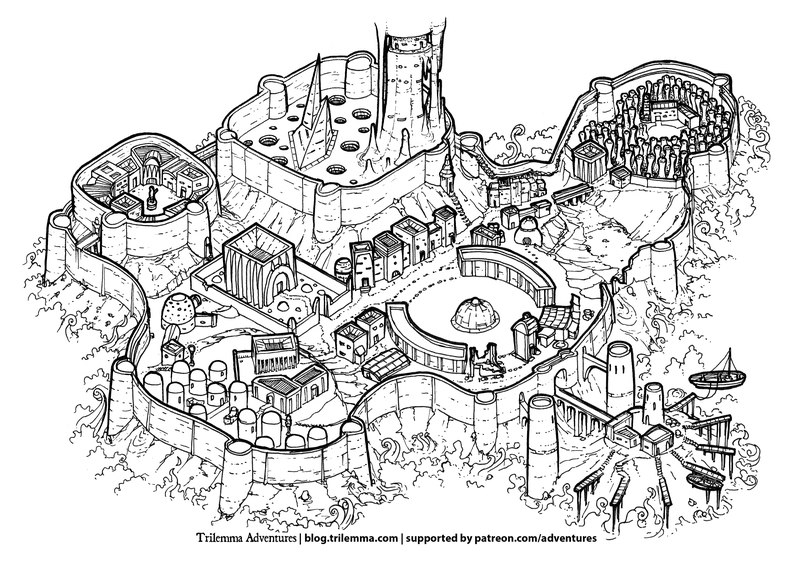 Sifoon is half settlement and half adventure - divided between safe and lost districts. Like Moon is a Mirror, there's a random element to the danger and treasure in each lost district; my goal is for each district to be an interesting landscape for the encounters to play out. As written, reaching or leaving Sifoon requires either magic or help from the Carreg. If that doesn't work for your campaign setting, consider making Ur-Menig a lake or sea surrounding an island with an atmosphere problem. As always, thanks to my generous patrons, the text and art is free for non-commercial use under CC-BY-NC 4.0! The muggy tropical coasts of the Caribbean have many dangerous harbours, but the unassuming Frigate and Barrel Tavern is one of the worst. If the scoundrels and thieves don't get you, the proprietors certainly will. This adventure is a collaboration with Ennie award winner Kiel Chenier. Wasting no time on a victory lap, he's hard at work on a wavecrawl setting and toolkit book called Weird on the Waves. 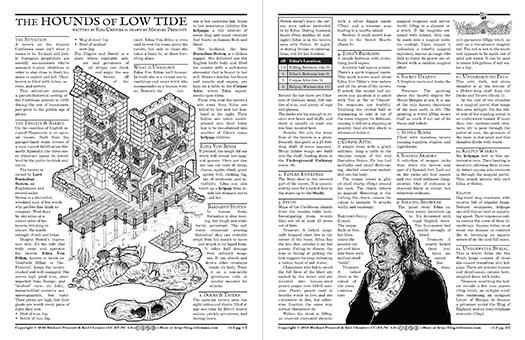 "Weird" is an unofficial Lamentations of the Flame Princess supplement, and the adventure assumes a pseudo-historical setting of the Carribean islands in 1655 during the rise of buccaneers, just prior to the golden age of piracy. Of course, this setting is just a suggestion. This adventure can be used in any fantasy setting of any time period, provided there’s a coast and fishing boats to sail along it. In any case, there are two versions of this adventure a systemless version, and one statted out for Lamentations! 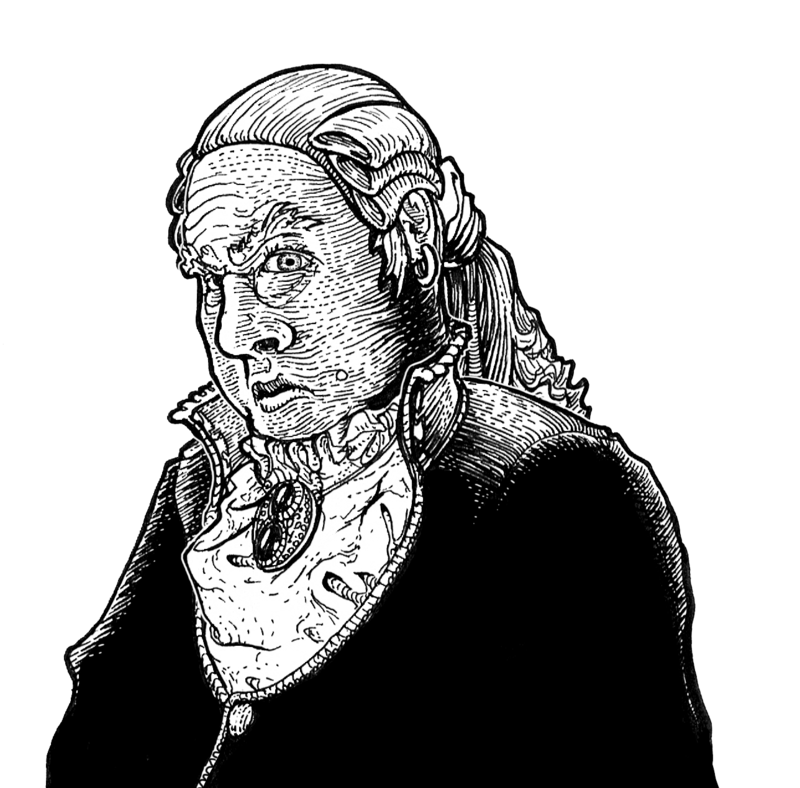 As always, thanks to my generous patrons on Patreon, all of the text and art is free for non-commercial use under CC-BY-NC 4.0!